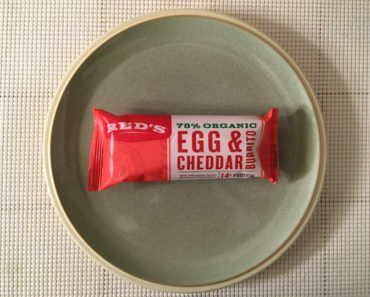 The Red’s brand was named after a dog, who apparently loved burritos. (What a cool dog Red must have been!) 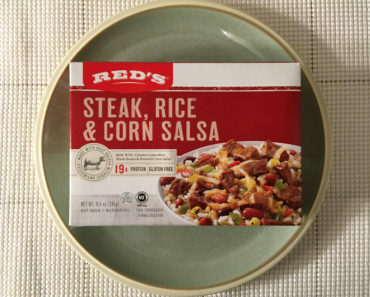 Just like Red, we love frozen burritos here at Freezer Meal Frenzy, so today we’re quite excited to try out the Red’s Bean, Rice & Cheddar Burrito. 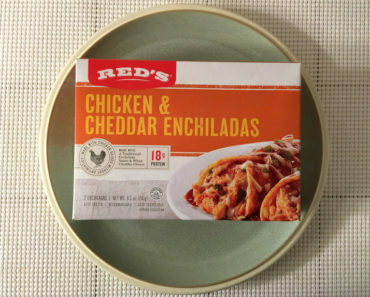 Now, while Red’s makes some very tasty burritos, they can be a bit tricky to cook. You’ll need to preheat your oven to 375 degrees fahrenheit, then thaw your burrito by heating it in the microwave for about a minute. After that, grease up a pan and put the burrito on it, then pop it into the oven for about 11-13 minutes. For the best results, flip the burrito over about halfway through the cooking process. After all this, out pops a burrito that is beloved by Red the dog. So let’s find out if it’s beloved by humans as well. 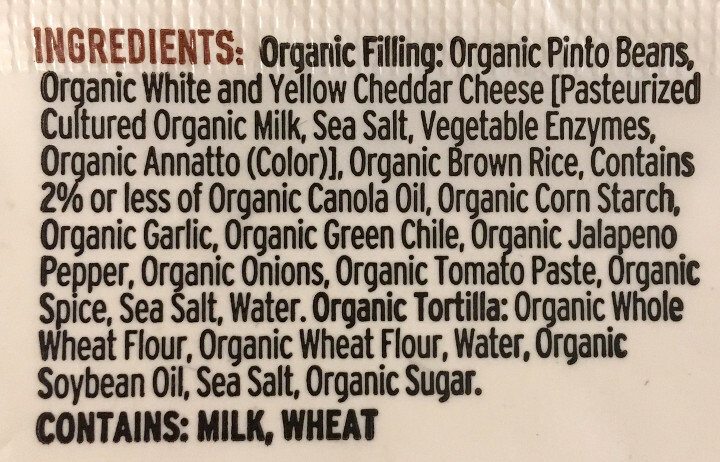 First off, we should point out that this comes encased in a whole wheat tortilla instead of a flour tortilla. You’ll notice right away that this is darker in color than its flour-based brethren. Now, if you look at the image above, you’ll notice a green chunk off to the right-hand side of the picture. What is it? That, folks, is a big piece of a jalapeño pepper. 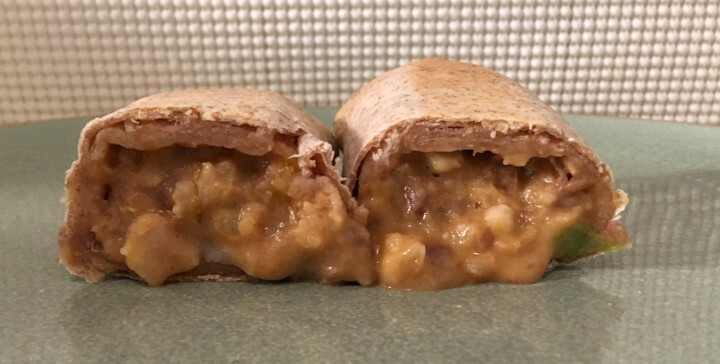 While we didn’t find a ton of the things inside this burrito, clearly there are some inside. They give this a little bit of a kick, though we’d hardly call this a spicy burrito. Mostly, the filling is rice and pinto beans. 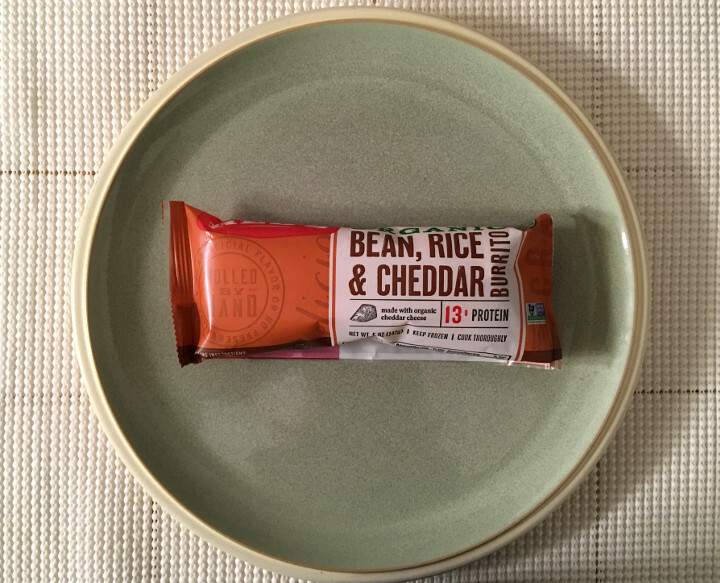 The pinto beans are a little dry, but the rice is pretty good, giving this a similar texture to that of a seven-layer burrito from Taco Bell (minus all the guacamole, of course). There’s also a mix of white and yellow cheddar cheese, though it’s pretty subtle. 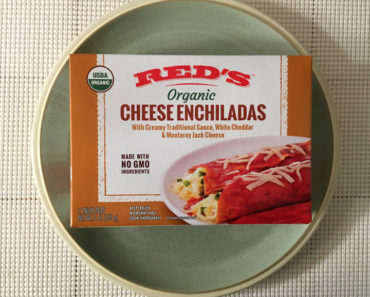 If you want a super-cheesy burrito, you’re probably better off with the Red’s Organic Cheese Quesadilla Burrito than with this one. At 310 calories, this is a bit more calorie-loaded than we’d hoped. 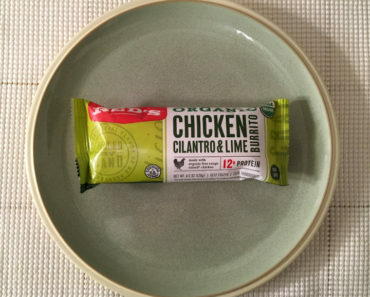 That’s not bad if you eat just one burrito, but we have a feeling you’ll end up eating a second one, since this isn’t very filling. Red’s Bean, Rice & Cheddar Burrito is alright. It’s really nothing special, though it tastes pretty good. While we definitely prefer some of Red’s other burritos to this one, we’re not going to steer you away from this. If nothing else, we’re sure your dog will love it. 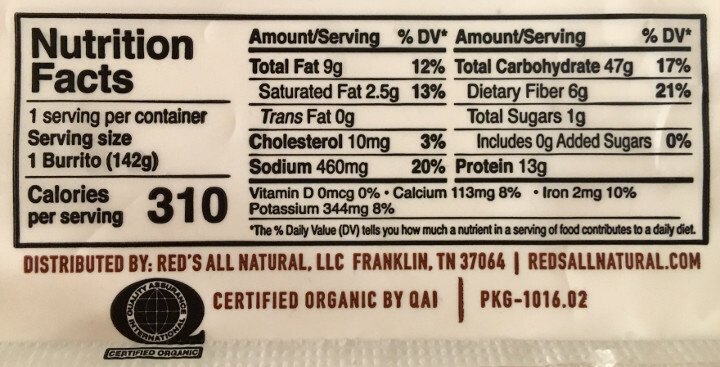 To learn more about the nutrition content or ingredients in this Red’s frozen burrito, check out our package scans below.